"Adoptable Pets from Silver Rescue"
When an animal control officer received the frantic call that a pit bull was roaming loose in a family neighborhood, he thought he had a hard job ahead of him. What he found upon arrival, however, was the friendly pooch you see pictured here—lying belly up in the sun after a long play session with the local kids. Just another case of a bully that apparently doesn’t know how to live up to his bad rap! Taken with Darrell’s goofy smile and tender heart, the officer couldn’t bear to bring him in to face euthanasia. Instead, he called Karina McDaniel with Silver Rescue, where the affectionate three-year-old pooch has been fostered for over a year now. In this course of his stay, he has completed professional obedience training, learned how to live in a home environment and undergone heartworm treatment. He now awaits the family that will look past the negative hype and into his soul of gold, offering him a lifetime home filled with all the love he deserves. October 23 is National Pit Bull Awareness Day, and if you’re not already a bully lover, I encourage you to join in the festivities to learn why pit bulls were once considered “the” All-American family pet—and how we can once again restore their public image and protect them from further harm. The bully breeds that were once called “nanny dogs” due to their gentle disposition with children have not changed in recent years—they are the same loyal, loving, intelligent and fun-loving canine companions they have always been. What has changed is that they have become the most abused dogs in our country, which fuels inaccurate stereotypes about their behaviors and temperaments. For more information, please visit blessthebullys.com as well as our education page at nashvillepaw.com/bully. 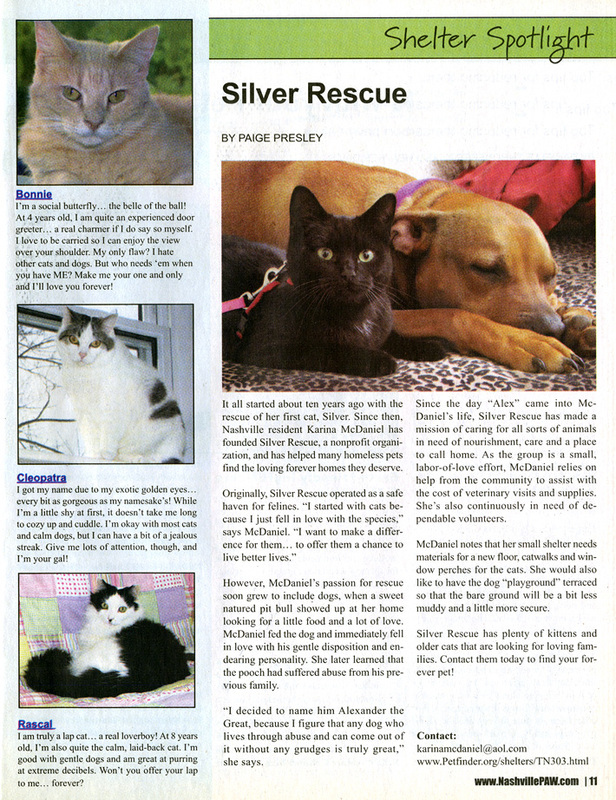 "Silver Rescue: A Rescue With A Heart Of Gold"
Silver Rescue opened its doors in 2000 with the rehabilitation of feral cats. In 2002 they began rescuing Pit Bulls and other canines in need of assistance of finding quality forever homes. In 2006 they applied for and were granted 501(c)3 status. Their canines receive professional obedience training and evaluation prior to being offered for forever home placement. They socialize all animals in their care with both canine and feline animals. Making their animals more easily placed in homes that have either or both. They list their available pets on Petfinder and Portal. If you would like to sign up, they have a monthly newsletter for subscribers with news about adopted and fostered animals and current needs. Their pressing needs to date are approved foster homes for canines and felines, blankets for indoor kennels for canines, paper towels, and are currently enrolled in the Hills Science diet food program. They are also in dire need of monetary contributions for vet care for animals in their foster program. Silver Rescue is like many rescues, not large in size but great in quality of life for its foster animals. They operate from donations and private funding. If you would like to volunteer, apply as a foster home or know more about animals available, they can be contacted here. To read other articles by this examiner, check out her bio and list of previous articles.